Tray -- I got this Zuma white rectangular tray from Crate & Barrel, but there are many options at various price points. Wall Paper -- This is called Devine Color Zigzag from Target. I initially bought it for my home office, but realized that it would work great here as well. Books/Magazines -- These keeps your reading material handy and allows the tray to be functional and not just aesthetically pleasing. Flowers -- Bring in the beauty with a small floral arrangement. 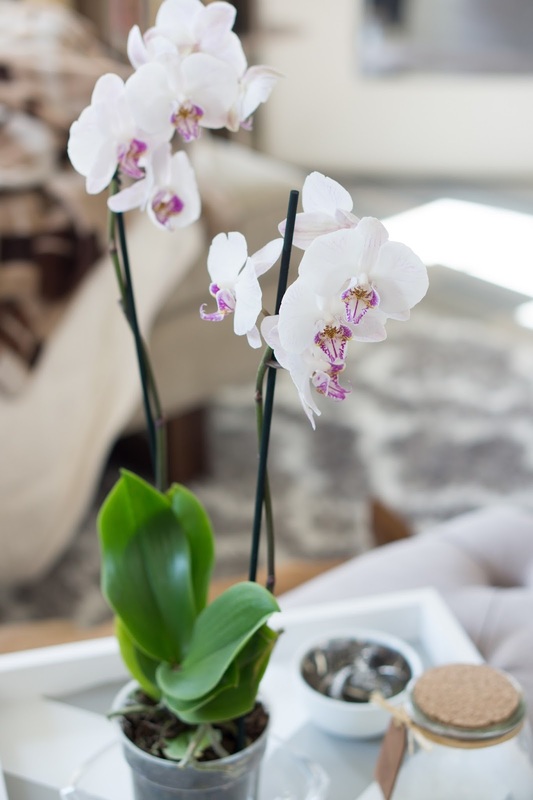 Go for something simple and tall like orchids and tulips or low and tight like peonies and roses. Texture -- Add some texture with a picture frame, candles or a home accent figurine. You want this piece not to be too big to overpower everything else on the tray, but to also not be too small so it doesn't just come off as an added tchotchke. 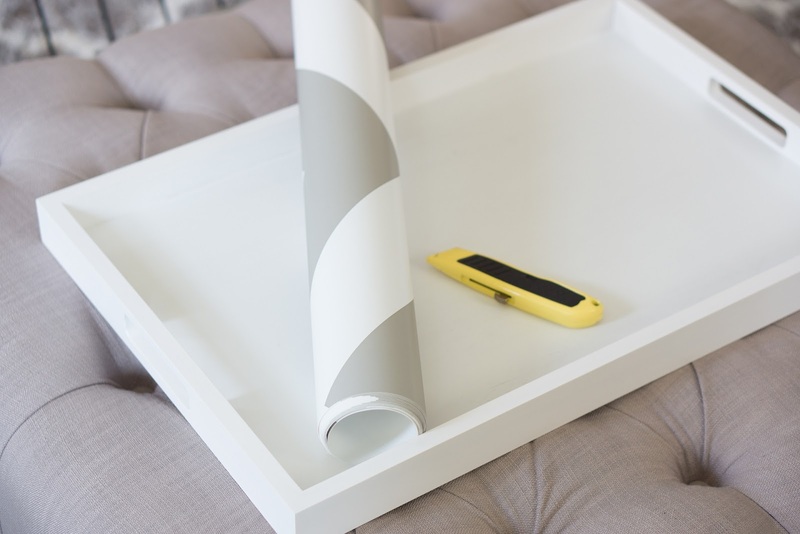 Line up the wall paper and use measuring tape to get the exact sizing of the paper and tray. Use a ruler and x-acto knife or something similar (like a box cutter) to cut evenly. It would be nice if you could use one of those industrial size paper cutters from school. 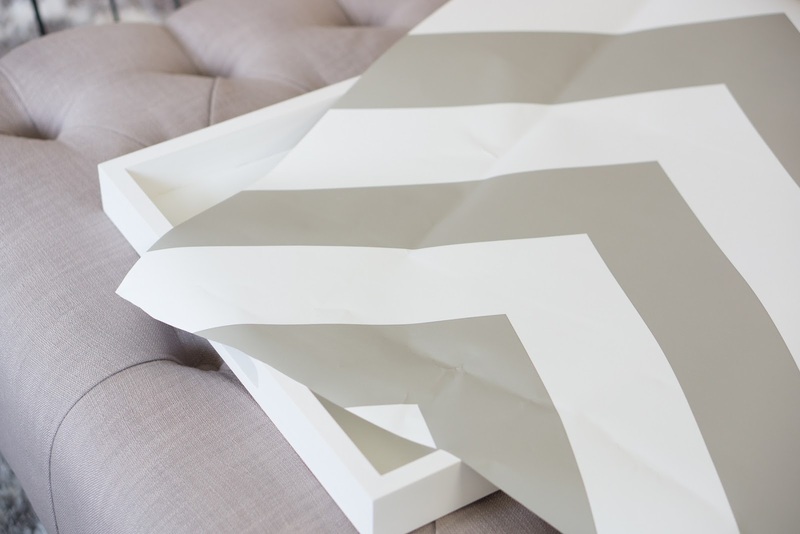 Peel off the backing of the paper and lay flat on the inside of the tray. I would recommend starting at one corner and slowly smoothing the paper as you go along. I used one of my books, but you can use a sponge to smooth out any bubbles. It might take you a few shots at smoothing out the wall paper, so get assistance to make your life easier, or just wing it. 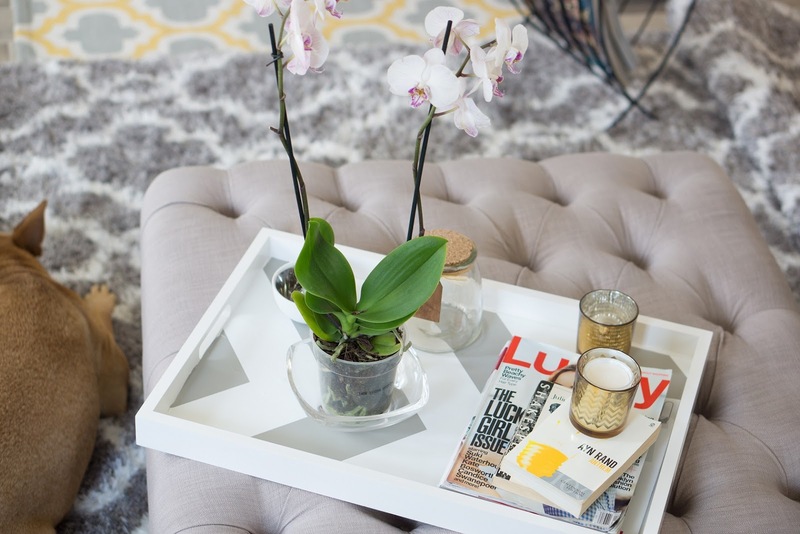 Place your decor items in a manner that draws the eye -- put a few things on an angle and play with sizing and shapes. You can find a lot of ideas on the Shopbop home decor page -- like the ever popular Jonathan Adler zebra dish. And add some books to your DIY tray. I have my eye on Shoestrology! I love this idea! Especially because you can take it off the table and put your feet up - we are constantly knocking things off ours. And it looks so pretty! 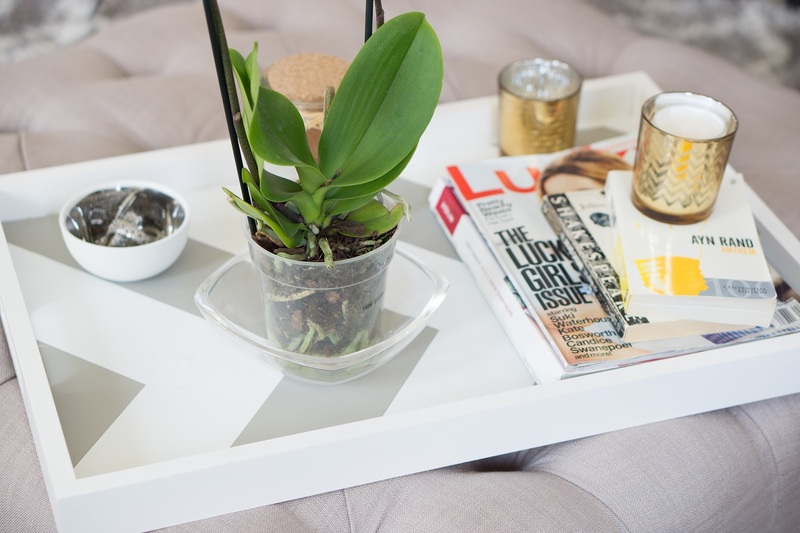 What a fun way to add a chic touch to a plain tray and I totally love the way you styled it as well. Great DIY and perfect timing. 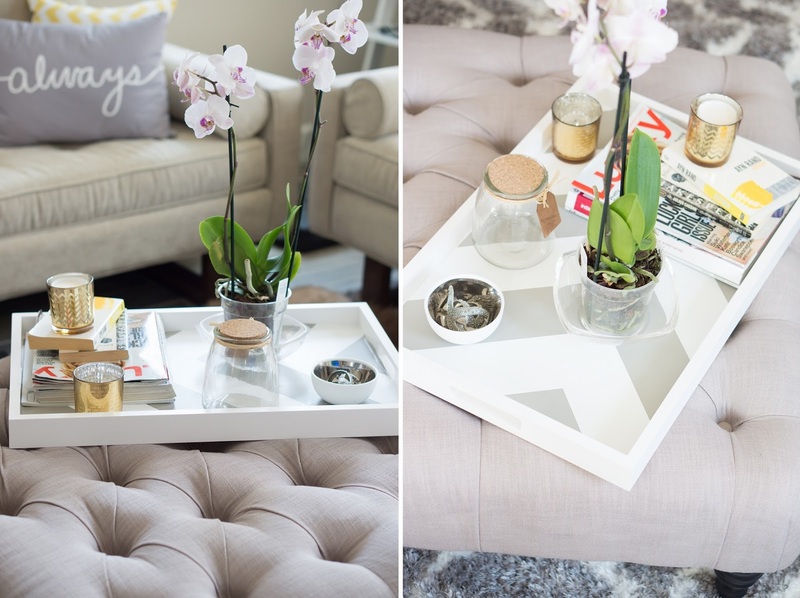 We're in need of another tray and this idea seems very doable! I am definitely going to try this! I LOVE your living room! Great tips, I will try to give it a go! PS OMG! So so dying for the GoT season premiere! I never thought to use wallpaper - genius! I love orchids too. There were so many in Taiwan and they were so lovely to see! What a great idea! I saw some wallpaper the other day that I am obsessed with, but did not know where I could use it! This is a great idea - I am definitely going to have to try this when I move into my new apartment! Ok, that's just brilliant! 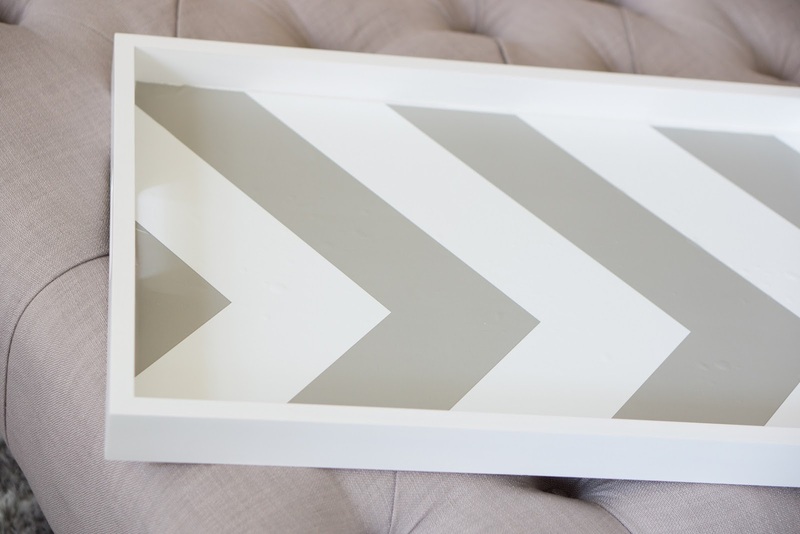 I love the chevron stripes!